Over the last 5 years, Envirofit’s Women’s Empowerment Program (WEP) has helped transform the lives of many hundreds of women. The program is designed to increase self-knowledge and guide women to develop an actionable growth strategy towards achieving personal goals. Women who complete the program say that it has changed how they see their role in their family and their community, and given them the professional and sales skills to sell three times as many stoves as men. 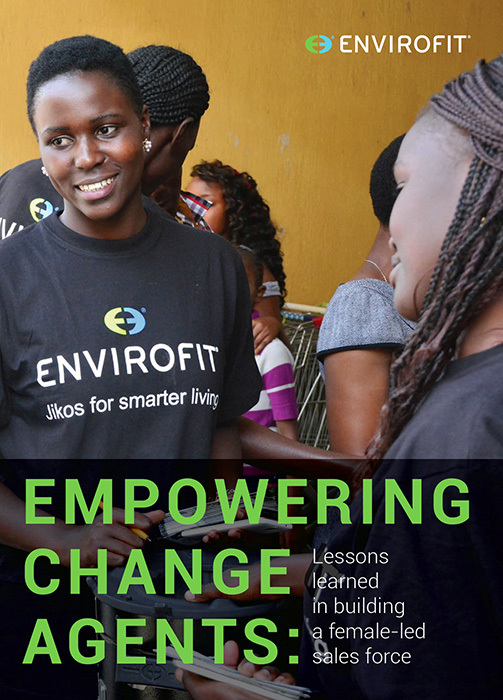 To mark the program’s fifth year in action, Envirofit has collected lessons learned while conducting the WEP around the world. The success of the Women’s Empowerment Program is only possible with help from the partners who have joined us in its design and implementation. Thank you to Energy and Environment Partnership (EEP), The Global Alliance for Clean Cookstoves (GACC), Shell Foundation, and Winrock International for their financial support. The WEP was also made possible through research and implementation partnership with Johns Hopkins Bloomberg School of Public Health, and pro-bono consultation assistance from Value for Women.